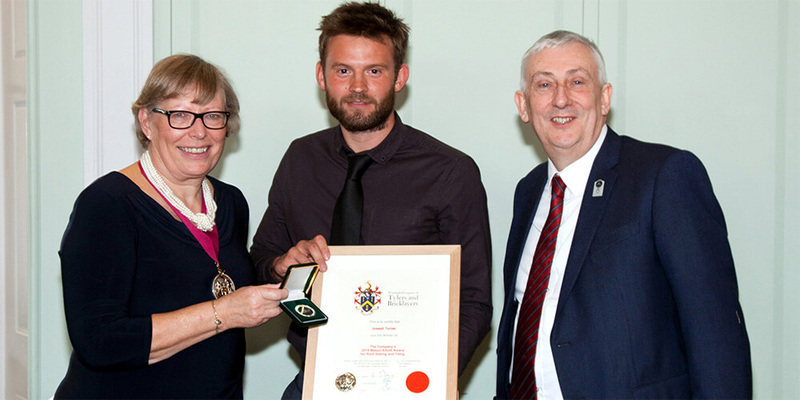 A LEEDS College of Building roofing tutor has been awarded an ‘Excellence in Teaching’ medal from the Worshipful Company of Tylers and Bricklayers, the first time the accolade has ever been presented. 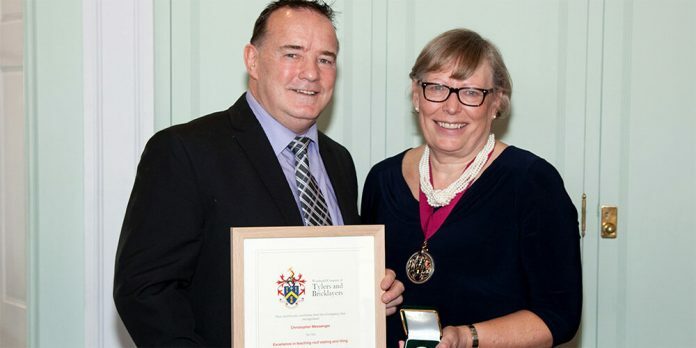 Chris Messenger, a lecturer in roof slating and tiling, was invited to the prestigious annual Craft Awards at Trinity House to receive an engraved medal and framed certificate from the ancient Livery Company of the City of London. The Worshipful Company of Tylers and Bricklayers encourages excellence and the highest levels of craftsmanship in the tiling and bricklaying industries. The new excellence award recognises the major contribution made in developing the skills of others in roof slating and tiling and for success in training young people who have gone on to achieve top places at international competitions. Since the initiation of competition training at Leeds College of Building in 2007, Chris’s apprentices have won a total of 15 SkillBuild/WorldSkills medals (six gold, two silver, and seven bronze) under his expert coaching. Leeds College of Building apprentice, Joseph Turner, also attended the event and was awarded the Mason Elliott Award for roof slating and tiling. In November, Joseph (an apprentice at The Roofing Corporation Ltd.) won gold in the ‘Roofing: Slating and Tiling’ final of the national WorldSkills UK competition at the NEC Birmingham. 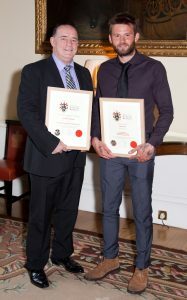 Chris Messenger said, “I was extremely proud and honoured to accept this award. Many of my apprentices have gone on to great achievements, some slating in Australia with the blessing of their companies and a job waiting on their return, some now running their own companies and sending their apprentices to train at Leeds College of Building with me.